Sandia’s Z machine has produced plasmas that exceed temperatures of 2 billion degrees Kelvin — hotter than the interiors of stars. The unexpectedly hot output, if its cause were understood and harnessed, could eventually mean that smaller, less costly nuclear fusion plants would produce the same amount of energy as larger plants. The phenomena also may explain how astrophysical entities like solar flares maintain their extreme temperatures. 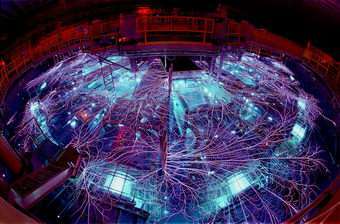 The very high radiation output also creates new experimental environments to help validate computer codes responsible for maintaining a reliable nuclear weapons stockpile safely and securely — the principle mission of the Z facility. The results, recorded by spectrometers and confirmed by computer models created by John Apruzese and colleagues at Naval Research Laboratory, have held up over 14 months of additional tests. A description of the achievement, as well as a possible explanation by Sandia consultant Malcolm Haines, well-known for his work in Z pinches at the Imperial College in London, appeared in the Feb. 24 Physical Review Letters. Z’s energies in these experiments raised several questions. First, the radiated x-ray output was as much as four times the expected kinetic energy input. Ordinarily, in non-nuclear reactions, output energies are less — not greater — than the total input energies. More energy had to be getting in to balance the books, but from where could it come? The new achievement — temperatures of billions of degrees — was obtained in part by substituting steel wires in cylindrical arrays 55 mm to 80 mm in diameter for the more typical tungsten wire arrays, approximately only 20 mm in diameter. The higher velocities achieved over these longer distances were part of the reason for the higher temperatures. Haines theorized that the rapid conversion of magnetic energy to a very high ion plasma temperature was achieved by unexpected instabilities at the point of ordinary stagnation: that is, the point at which ions and electrons should have been unable to travel further. The plasma should have collapsed, its internal energy radiated away. But for approximately 10 nanoseconds, some unknown energy was still pushing back against the magnetic field. High temperatures previously had been assumed to be produced entirely by the kinetic flight and intersection of ions and electrons, unaided by accompanying microturbulent fields. Z is housed in a flat-roofed building about the size and shape of an aging high-school gymnasium. This work has already prompted other studies at Sandia and at the University of Nevada at Reno.